Wheat germ oil is acquired from wheat kernels, scientifically known as Triticum vulgare plant, belongs to Gramineae family. It was originated in India and commonly cultivated in Southwest Asia, China, North Africa, Arabian Peninsula, Turkey and South Europe. Wheat germ oil is extracted from wheat kernels through cold pressed methods and by supercritical extraction. Wheat germ oil is constitutes of lecithin, Vitamins (A, D& E), linoleic or omega-6, palmitic, oleic acid, linolenic or omega 3 fatty acid. Wheat germ oil is dark yellow to brown in colour and its aroma is strong and has thick consistency. It well blends with other oil such as lavender, sandalwood, ylang ylang and orange etc. Wheat germ oil has antioxidant and anti inflammatory properties so it repairs skin, reduces wrinkles. 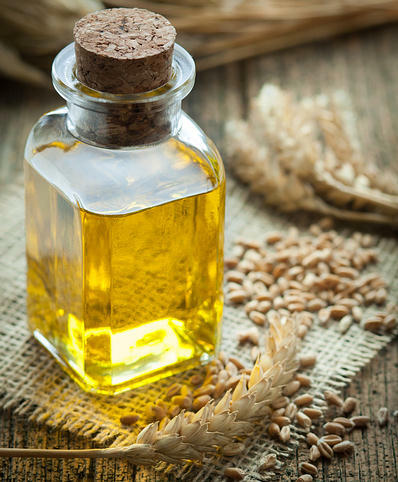 Wheat germ oil is used in cosmetics and skin care products as it moisturizes and smoothes irritated or dehydrated skin. It promotes healthy skin as it boosts to skincare and improves glowing skin. It provides strength to hair. It reduces inflammation; it is effective against redness, irritation and dermatitis. It boosts collagen and elastin production as it contains Vitamin E which stops free radicals and reduces stretch, wrinkles and sagging. It improves blood circulation, ensures more nutrients and oxygen get to skin and eliminates toxins and waste from it. It helps in treatment of skin problems like vitiligo, psoriasis, eczema and other skin irritation and damage from sunburn. It promotes cell generation and growth, maintains a healthy immune system, cardiovascular system, nervous system and reproductive system. It reduces blood pressure and cholesterol levels. It promotes muscular system, muscles growth and muscle coordination. It improves endurance and provide relieves from muscle aches, muscle spasms and muscle fatigue. Wheat germ oil is added in baby foods because of its nutritional value. It is used in aromatherapy because of its moisturizing qualities. If people have allergy with wheat, they should avoid wheat germ oil either externally or internally. Botanical Source : Triticum aestivum L.
Appearance : Light yellow coloured clear liquid. Solubility : Practionally insoluble in water and alcohol.